This is the finished piece I posted about in progress awhile back in Pretty Lace. 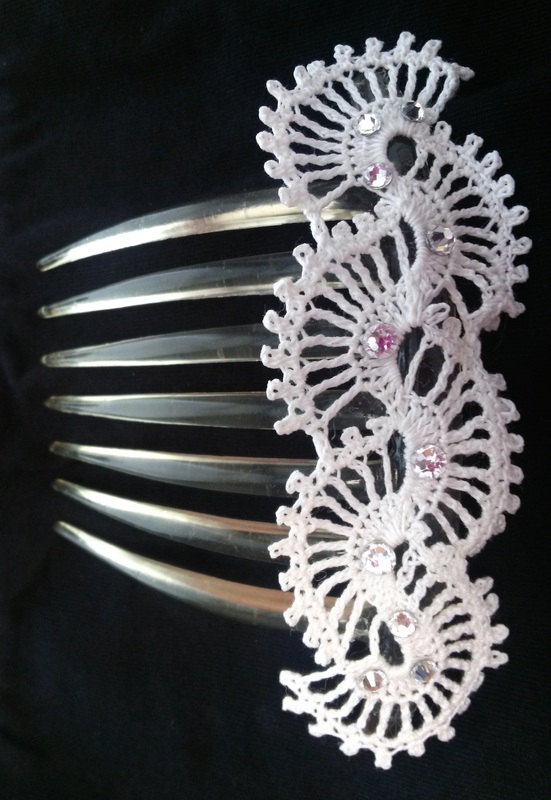 It’s a very simple lace motif, added to a hair comb with some Swarovski Elements for embellishment. I wore this for the Bridal Show that my Sister over at Vintage Wedding Gems did recently. There are so many things that can be done to customize this. I can use reclaimed, vintage thread from old doilies, bedspreads or table cloths. I can also make it in new thread in dozens of different colors. It can be added to a clip or button loops instead of a comb. And embellishments are only limited by your imagination! Just a quick post here. Here is the latest piece I’m working on. 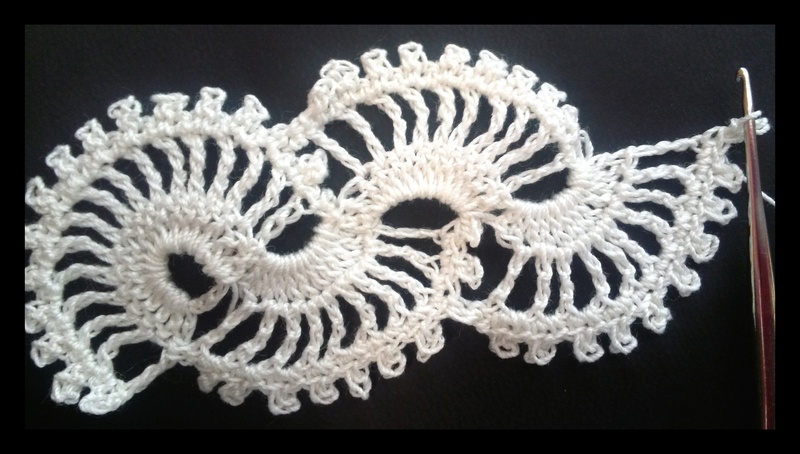 It’s a bit of pretty lace. I didn’t design this one, just using the pattern. 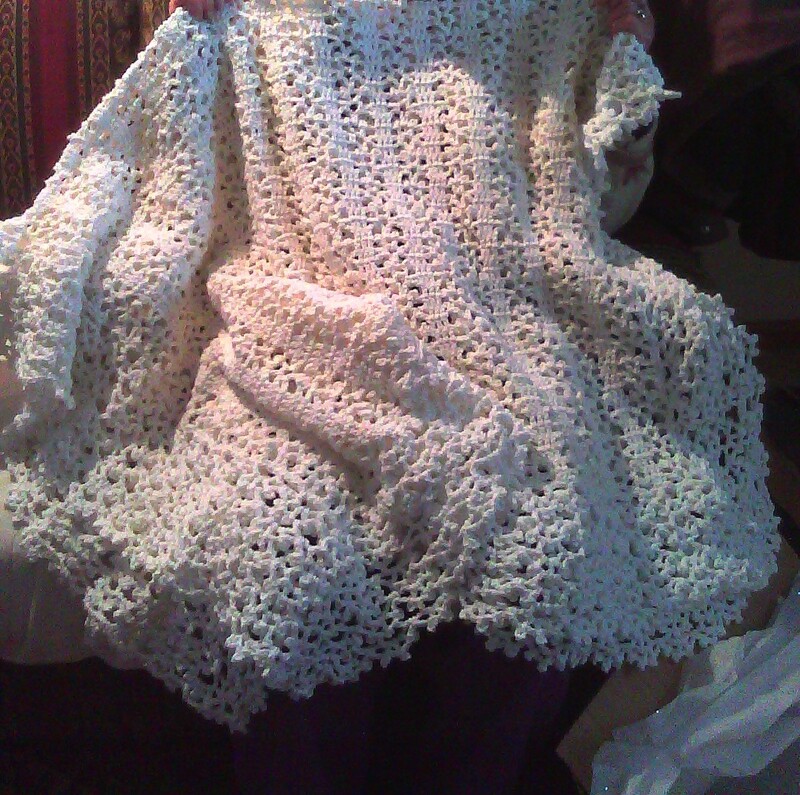 It’s not washed or blocked yet, let alone even finished but it should come out very pretty. I’m also working on a modification to the crocheted tape I posted. It’s soaking in starch right now, so hopefully in a day or two I should have a neat surprise. I finally found this picture. I knew I had it somewhere. This was the first time I made the “Timeless Lace” afghan mentioned in my previous Lacy Afghan post. 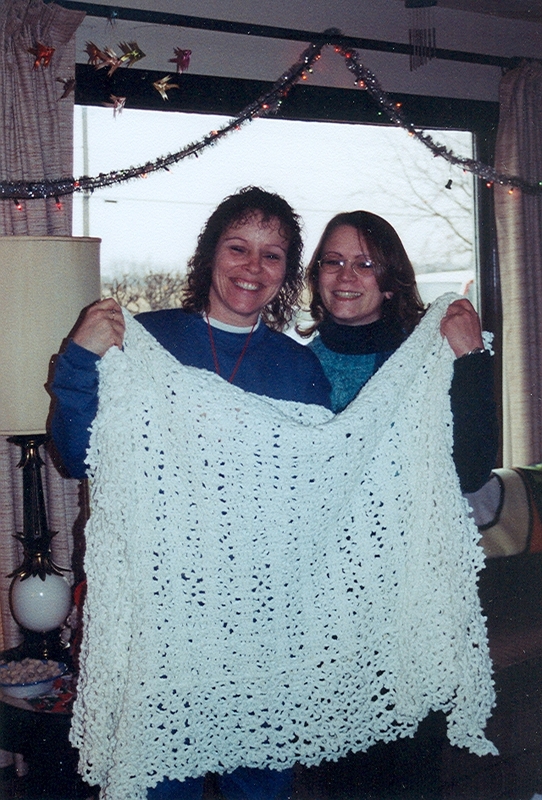 This is my Aunt Becky on the left at Christmas oh…what, 10 or 11 years ago I guess? Gosh I don’t remember. Maybe more than that. The Timeless Lace afghan was her present that year. Grandma is gone now, but see the ribbon goldfish mobile hanging in front of the window in the background? That was hers, and Grandpa was nice enough to let me have that after she passed. It’s hanging in front of the window in my livingroom now. I just love it, and I think of her every time I look at it! Anyway. Sorry, I digress. Back to the afghan. I remember Aunt Becky being very excited when I gave this to her that year and I hope that she has enjoyed it! I believe I’ve made two more of these afghans using this pattern. If you received one of them, please send me a picture and I’ll post it! This is the Christmas present that I gave to my Mother-in-Law this year. I just love this pattern, it’s so pretty. I’ve done three of these now, one for my Aunt Becky, one for my Sister for her wedding, and now one for Mom. 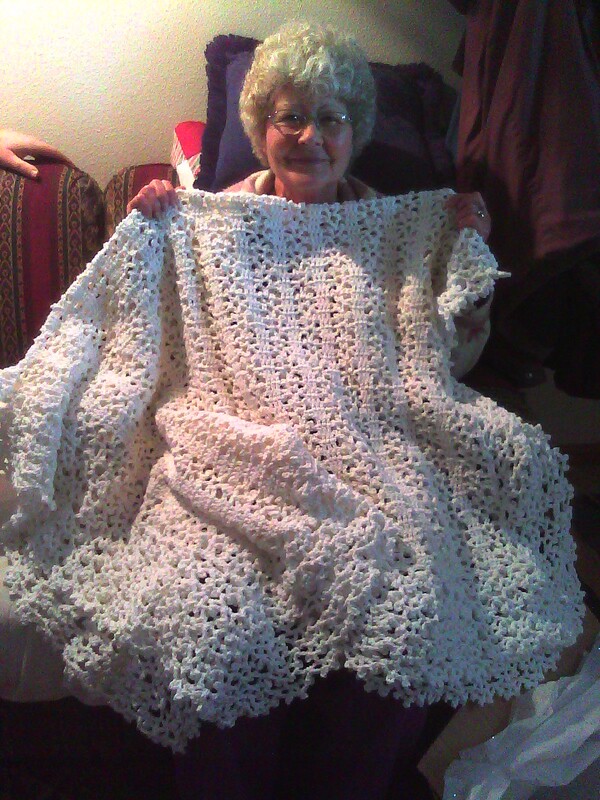 The thing that makes this afghan is totally the edging. The first time I made this I had never done picots before. I initially found those pretty challenging, but now I’ve also made them with thread. I hate making them with thread, but I find making them with yarn to be much easier. 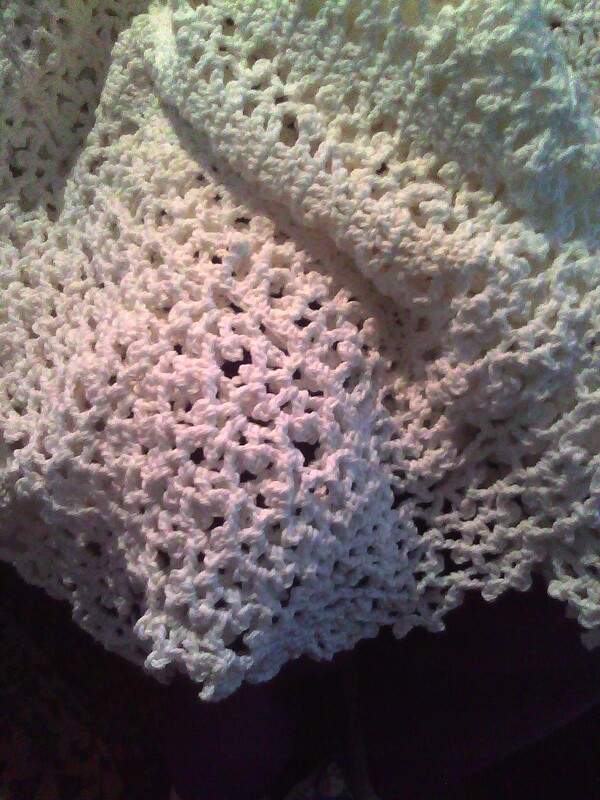 The pattern didn’t call for it, however I used cones of cotton yarn instead of worsted weight yarn. It gives this afghan a really great weight and looks very nice with the picots. I’ve been trying to think of something really amazing that I could work up to enter in the CGOA contest at the conference in July. Looking at this I think it would be really neat to create similar pattern for a wrap or a shawl. I’ll keep you posted on that front. UPDATE: I had someone ask where they could get this pattern. It’s from a Leisure Arts pattern book: “Best of Terry Kimbrough Afghans.” The pattern name is “Timeless Lace.” I did not find the book on Amazon, but you can get it on the Leisure Art’s website for $12.50. There are 26 afghan patterns in this book and I have made several of them. Click on the picture for the link to the book on the Leisure Arts website.